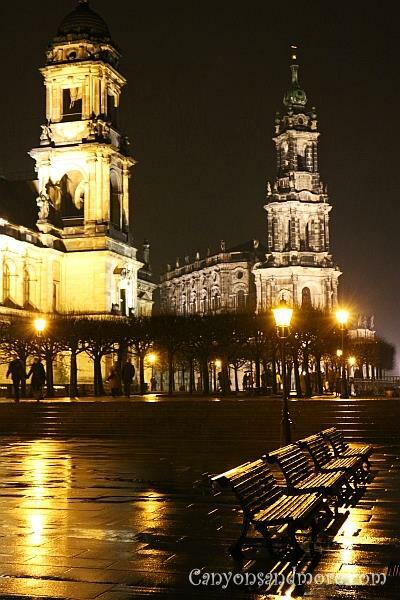 Dresden is the capitol of the Free State of Saxony, has a population of over 500,000, is located on the Elbe River and is really one of Germany’s most beautiful cities. Though heavily bombed during the second world war, it has been well restored since then and is a gem of a city. It is occasionally called “Elbflorenz” meaning Florence (Italy) on the Elbe. 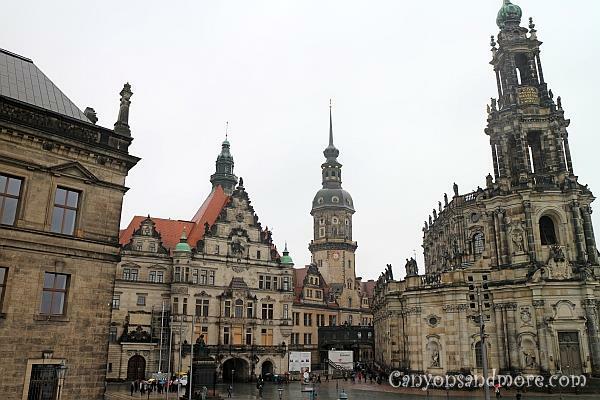 If you visit Dresden, many of the fascinating historical and cultural highlights such as the royal palace, the Semper Opera House, the cathedral, the Church of our Lady, the Church of the Holy Cross and the Zwinger are concentrated in the old historic city area which makes it easy to discover it all by foot. A lovely way to see it all from a distance is to cross the bridge located close to the cathedral. 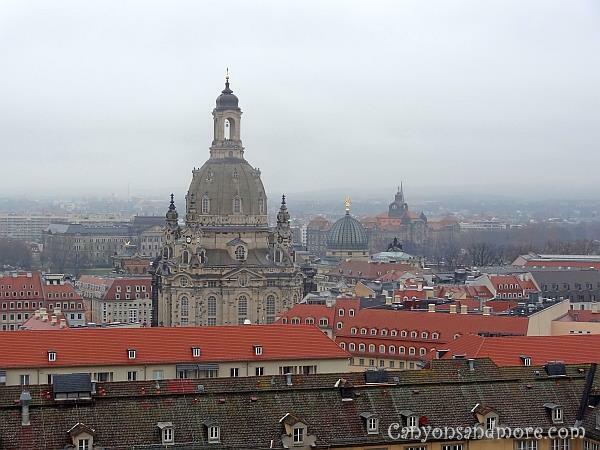 The image above shows a 360° view over Dresden can be seen from the dome of the “Frauenkirche”. This scene in this direction shows you, among other attractions, the “Residenzschloss”, the cathedral and the Elbe River. 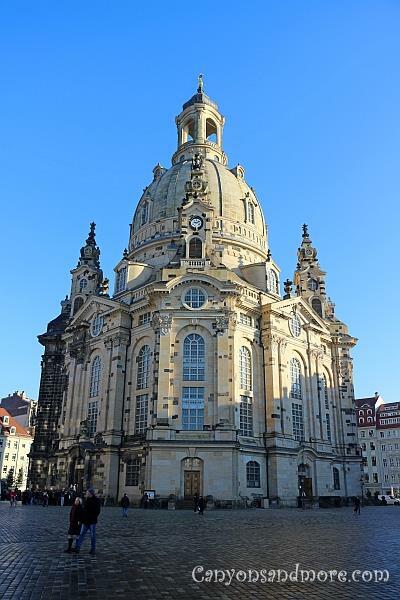 This is the famous “Frauenkirche” or the “Church of our Lady”. You can enter the church for free and be amazed at the light and elegant style of architecture inside. The altar, the organ and the view up into the dome are especially worth seeing. The church was totally destroyed during the 2nd world war and remained as a ruin until 1994. When in the church, it is forbidden to take pictures. You can enter the church from another side and from there you can pay a fee to go up to the dome area. You can enter an elevator which takes you up to a higher level and from here you continue up a spiral walkway to the top. The center of the spiral is protected by glass but you can view down into the church from this area and it is allowed to take pictures. 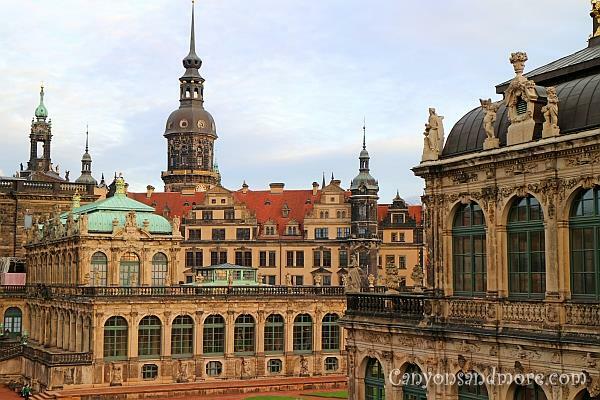 Once up at the dome, you have a magnificent view of the city of Dresden. This is the inner area of the “Zwinger”. This image was made in winter so in summer, there are most likely more flowers blooming and the fountains filled with water. There is no entry fee to see this area and it is possible to walk on the outer walls as well. 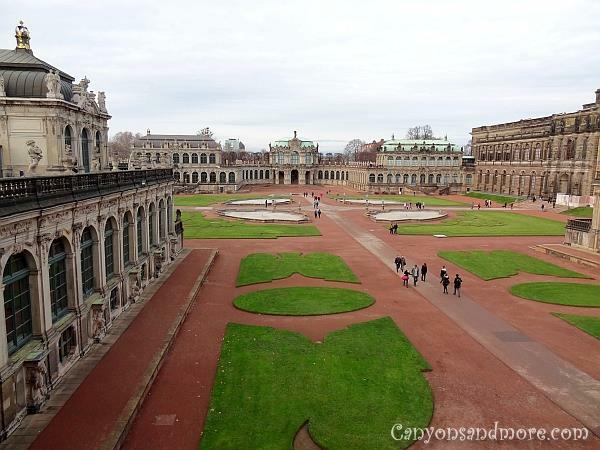 When you walk along the walls of the “Zwinger” you get a lovely view of the area below you you can pay attention to the impressive ornate details of baroque architecture of the complex. From this point on the wall, you can see the “Residenzschloss” in the background. The “Zwinger” is home to several museums, including the “Old Masters Picture Gallery”. 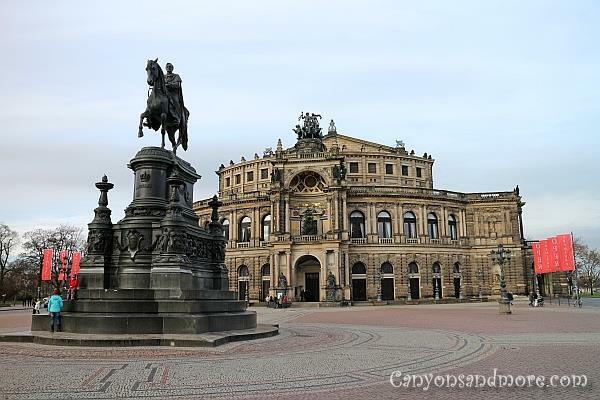 For a taste of culture while in the city, you can visit the Semperoper or the “Semper Opera House”. It is located on “Theaterplatz” and is directly across from the palace and the cathedral. 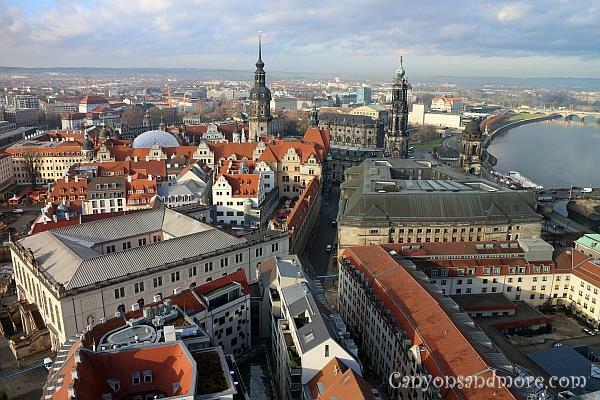 This is another possibility to see Dresden from above. For a fee, you can climb up the 92 meter high church tower of the “Kreuzkirche” or “Church of the Holy Cross” and enjoy the spectacular view of the city. Here you see the famous “Frauenkirche” or “Church of our Lady”. During December, you can also look directly over the “Striezelmarkt” Christmas market from the tower of this church at the Altmarkt Square. You can only enter this church tower until the early afternoon hours (in December) so there is not a possibility to see over the Christmas market during night hours when the stalls are illuminated. The “Kreuzkirche” is also worth seeing even if you are not intending to go up the tower of it. 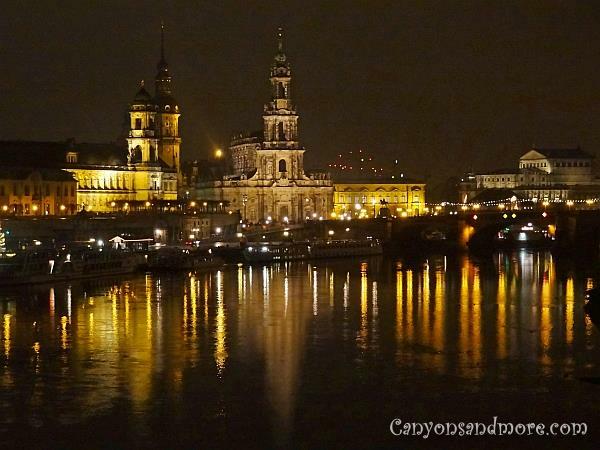 From the “Carolabrücke” you can take lovely photos of Dresden across the Elbe River. The Dresden skyline at night is really beautiful. Stroll along the “Brühlsche Terrase” and enjoy the sight of the palace and cathedral. This was a cold rainy evening in December and looked especially romantic. 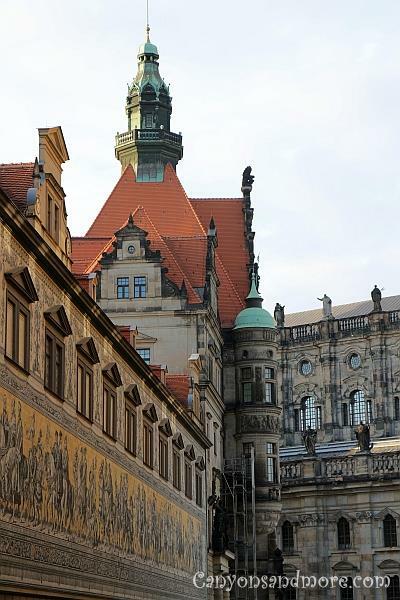 This is one side of the “Residenzschloss” or “Dresden’s Royal Palace”. The details of the architecture are amazing and the mural on the wall depicts leaders and royals of the past centuries. The palace is also home to many museums that you can visit for a fee. Another view of the palace, this time next to the impressive cathedral St.Trinitatis (Sanctissimae Trinitatis), which also happens to also be the largest cathedral in Saxony.